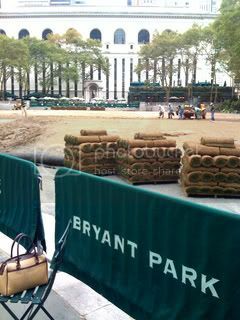 The lawn is back in Bryant Park! In just one day the transition was made from a bed of dirt to a beautiful blanket of green grass. Photos below: left, the park yesterday; right, the park today. 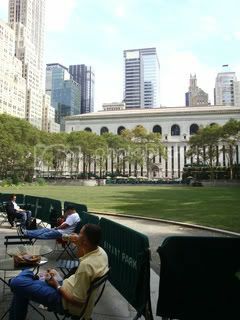 The new grass needs a little time to settle in, but the lawn status message at the top of bryantpark.org will be updated as soon as it’s open to the public. In the meantime, relax at the Southwest Porch, open for business again post-Fashion Week. For facts about the lawn (and a trip down memory lane) take a look at our very first blog post, when the lawn was opened for the summer season on April 24, 2009.